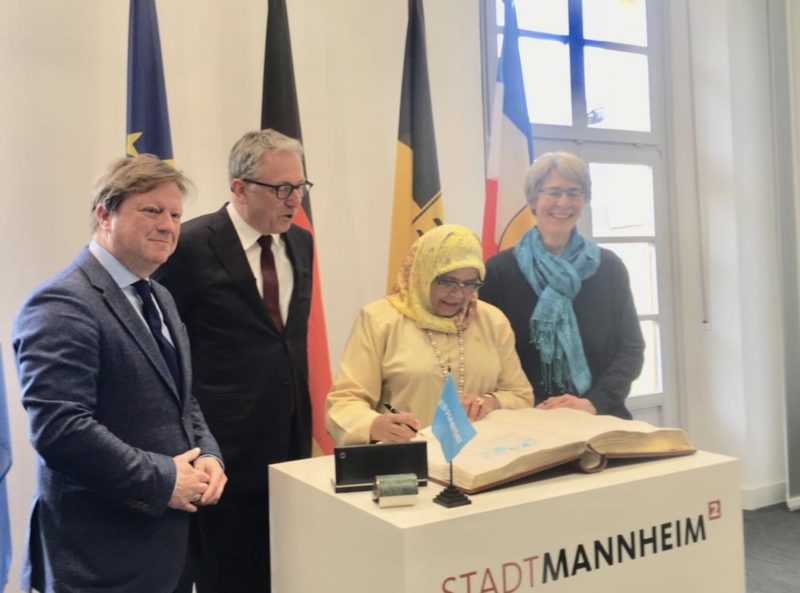 The roundtable organized by UN-Habitat in collaboration with the City of Mannheim took place on 25-26 of March with the aim of advancing partnerships with the private sector to accelerate the achievement of the goals of sustainable development in cities. Peter Kurz, Mayor of Mannheim and Maimunah Mohd Sharif, Executive Director of UN-Habitat, along with his team met with 40 participants -- cities, business representatives, associations, the banking sector, and think tanks -- to share their experiences in collaborations, and to elaborate upon recommendations to be used as the strategic base ahead of the General Assembly of the UN-Habitat this coming May. The working sessions consisted of various groupings, including small group exchanges to discuss concrete experiences (such as Kisumu, Kenya, or San José, Costa Rica) alternating with roundtables (discussing relationships between municipalities and businesses, and innovative financing), and debates contributing to specific issues (mobility, energy saving, cultural industries). These sessions were also complemented by plenary sessions designated to synthesize the contributions and to formulate strategic and operational recommendations. United Cities and Local Governments (UCLG) was invited to lead a roundtable during which two cities (Mannheim and Katowice), alongside various representatives from the private sector, were able to discuss their own expectations and limitations with the idea of improving their partnerships so as to better serve their communities. The roundtable enjoyed an open, and frank dialogue in which cities recalled the importance of opening spaces for pre-dialogue with enterprises and the private sector – and mentioned the indispensable role that local governments play in creating a favorable, safe, and stable environment for dialogues with investors in order to generate local economic development. At the end of these sessions, all representatives were in agreement that it is essential to increase and improve the involvement of the financial sector within the strategic dialogues taking place. Representatives from the private sector stressed that better coordination among the United Nations agencies would increase the effectiveness and impact of this collaboration. Read more information about this meeting here.